A flowers petals, a changing colour in a leaf, the perfume of freshly ground coffee…or did we just grab that coffee, follow the same route to work, raced because a green light turned red, or flipped because the cue was to long …. Interesting question, Yvette. I’d love to say that I would surely notice the quality of the music and would stop to enjoy the free concert — but I know otherwise. Back when I depended upon the subway for my commute, once the car’s doors opened at my destination, it was off to the races. Who knows how many budding young artists I passed daily? Ah, hindsight! I know too,in the rush of the rountine of the morning it’s tunnel vision until you reach your destination! It’s one minute to stop and listen we probably wait longer for the green walkway light !! Awesome article and reminder of how unconscious we are of living our everyday lives. I think though, had I been there to hear the music, wild horses could not have driven me away. Today I will make a point to listen to the music! Our friend that day told us a story that one famouse violinist was playing on the road just for fun. some few of the bypasseres (1 out of 100) would stop and listen for max 1 min. They r getting it for free and they dont want to listen the people, but the next day when he was playing in a concert house, one ticket for the show was over a 100 euro. people will look and see the beauty in nature only if u gift wrap a tree. Yvette, such a timely article for me. And interestingly I’m getting to read it this morning just after I noticed a sense of quiet beauty in the atmosphere. It’s very overcast outside this morning, and their was a crow on top of the roof to greet me with a keen message. Then I noticed the stillness and the whoosh of wings in a tree, the smell of fallen leaves in the moist air, and the complete stillness of the morning. There was a holiness about those few moments. Thank you for this reminder. 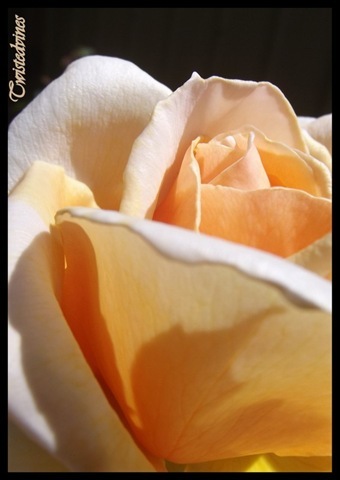 I love the look of your rose photo. The rose petals are perfectly blushed, and the edges of the petals take me in with their perfect crinkles. I really noticed them. A little explanation about fallen leaves this time of year; our Live Oak trees drop their leaves in February and then immediately bloom. So it feels like Autumn.